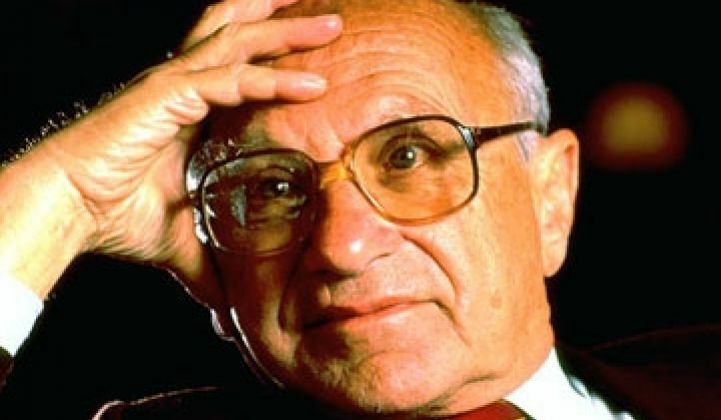 Was Milton Friedman Greentech’s Biggest Enemy? Mr. Free Market encouraged companies to solely look at profits, which retarded the growth of sustainable business practices, says one CEO. Why don't CEOs of major corporations think about things like sustainability or take creative approaches to reducing waste and energy? "My answer is two words: Milton Friedman," said Ray Anderson, founder and chairman of Interface Global, a billion dollar-plus carpet manufacturer, during the question and answer session at the Sustainable Industries Economic Forum in San Francisco today. "He said business exists to make a profit, but that is so upside down. There must be a higher purpose." Anderson, though, was not calling upon the corporations of the world to become philanthropic organizations, so don't spit up on that latest copy of Forbes yet. His larger point was this: Corporations and the executives who run them can and need to take a broader view of how they achieve their profits. If a company spends extra money on erecting a LEED office space, and that money in turn leads to greater productivity and lower employee churn, it's a good investment. In Friedman's view, that investment could easily be viewed as frivolous. If anything, Interface stands out as an example of how sustainable business practices can help the bottom line. In 12 years, the company has reduced greenhouse gas emissions by 71 percent. Energy intensity in operations is down 41 percent. Water consumption is down 74 percent. Interface now uses 24 percent renewable materials and will move to 100 percent by 2020. One third of its smokestacks have been closed. Yet, sales have increased by 67 percent "and profit margins are up," he said. The company has also had quite a bit of success with biomimickry. After studying patterns in nature, company designers came up a new line of carpet tiles, called Entropy. The tiles are all similar, but not exact. When the tiles are installed on a floor, you get a harmonious whole. However, if one wears out, you can replace it without ruining the overall effect: with homogenous tiles, the new one can glaringly stand out. Entropy has become one of their biggest sellers. It is also studying the adhesion in geckos to see if there are ways to replace glues. To move toward sustainability, one of the best things a company can do is concentrate on reducing waste because the results can be obtained and measured quickly. "By attacking waste first, we got ahead of the cost curve," he said.